Nifty Nut Butters make hand made nut butters with unique crafted flavour combinations you wont find in the shops. 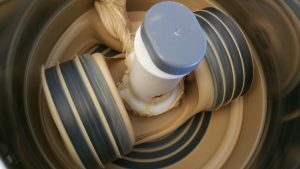 All our butters are stone ground for hours for a perfect silky smooth finish. 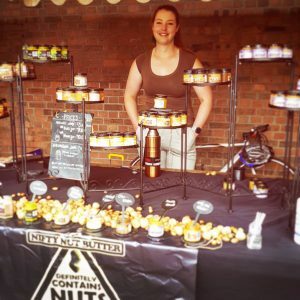 Nifty Nut Butters started in 2015, purely as a hobby. I was really interested in seeing how more unusual nuts would taste in buttered form – and from this I got to adding different flavour combinations that compliment each nut’s unique taste. This seemed like such a massively unmapped food it was my natural choice for a hand made product to sell in our town’s local farmer’s market. 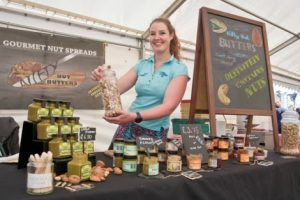 I received wonderful feedback from all the market patrons, and while I kept Nifty Nut Butters as a hobby business for a a few years it eventually overtook all my free time and I took the plunge and went full time with it. Today we travel to all sorts of food festivals, and sell in many independent retailers all over the country. We believe in taste first and all of our butters pack a punch, leading to a jar that isn’t just a spread but can also be used in cooking, baking, marinades, sauces and much more. We are 100% vegan, and do not use preservatives or processed ingredients. Everything we put in our jars is kept at simple as possible for an honest and rich tasting artisan nut butter.